With the cutting tool from Schwarze-Robitec it is possible to produce tube components with large diameters up to 3 inches (76 mm) in high quantities. Cutting tool 2.0: Schwarze-Robitec has expanded its cutting tool and has combined the bending and the final cutting of short bent tube components for large diameters of up to 76 mm (3”) – and that in only one single working step. To do this, the cutting tool is integrated into the bending tool. This makes the whole process much more efficient and economical. Until now, this was only possible for smaller diameters. The user's benefits: a decrease in scrap material up to 90 percent and clearly reduced production times. 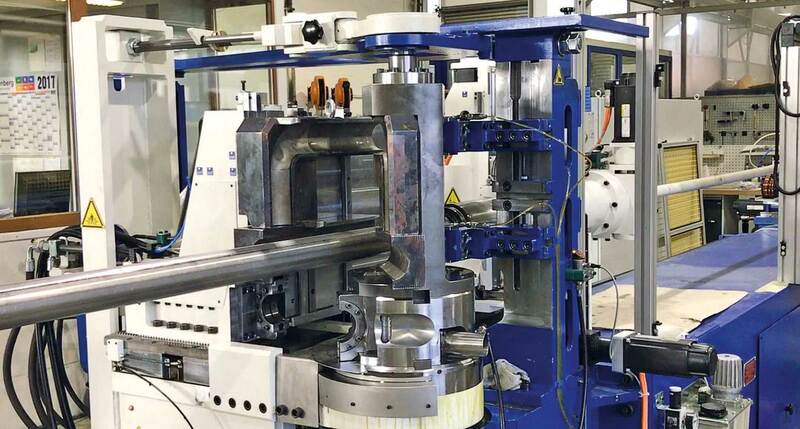 Consequently, the system of the integrated cutting tool is perfectly suited for producing parts in high quantities due to the immense material and time savings. Numerous users in the automotive sector or the supplier industry are already using this system successfully. To enable these advantages to be used with tube diameters of up to 76 mm (3”), Schwarze-Robitec has optimized the cutting tool. The tools can process these precise cuts in the shortest time possible. At the same time, the material savings prove to be very high: until now, up to 100 mm scrap accumulated for each part produced, depending on the bending system used. A high cost factor, which is significantly reduced with the integrated cutting tool. Machining of longer pipe units instead of cut-off pipe sections is also possible thanks to the integrated cutting process. This also reduces the time required for loading and unloading the machine. With the new cutting technology all components receive a clean cutting edge and can be immediately processed further. Therefore, this technology is particularly suitable for series production, for example, in the automotive sector or the supplier industry. This is where the savings of resources and time play an important role. The controlled chip removal process keeps most of the chips produced during the cutting process away from the machine. A prerequisite for integrating the technology into all-electric machines of the high-performance series is the use of the CNC control NxG. The new controlling system enables the cutting at any bending angle between 0 and 90 degrees and is simply integrated into the bending program. The cutting tool processes all common materials – including aluminized steels or hard-to-cut materials, such as chrome-nickel steels.